I had the pleasure a few weeks back to discuss kids, transit, living carfree, and other urban issues with the folks on the excellent podcast TransitMatters. If you're not familiar with TansitMatters, check them out - especially if you're in the Boston area. They are an advocacy organization "dedicated to improving transit in and around Boston by offering new perspectives, uniting transit advocates, educating riders and promoting a level of critical analysis normally absent from other media." Subscribe to their podcast on iTunes, your favorite podcatcher (yeah, I'm holding on to that term), or at their RSS Feed. Also find them on Facebook, Twitter, donate, or volunteer. If you liked the episode, be sure to let them know too. P.S. If you are familiar with TransitMatters, know that I spend days considering what Parks and Recreation reference I was going to make following the intro and I came up with nothing. I hope I can go back on someday just so that I can reveal my inner Perd Hapley. This is the first in (hopefully) a series of guides for riding public transit across the world with your kids. Would you like to help add information about your city? Drop us an email at transitinfo at acrossb dot com. 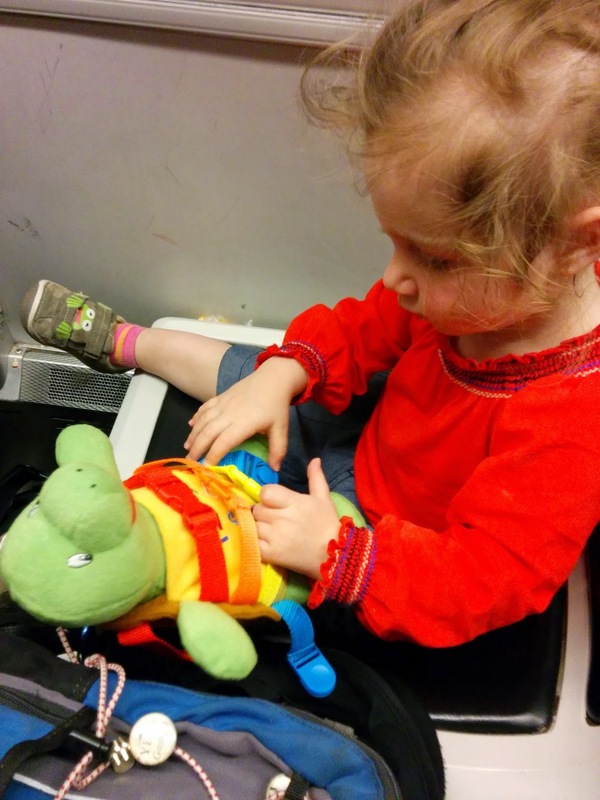 Taking the MBTA with your little ones will make you think about the MBTA in new and unexpected ways. Maybe you've never really cared much about "new" vs. "old" style Green Line cars, or why using an elevator at South Station forces you to go outside when switching from the red line to the commuter rail, or which exit from Harvard involves the fewest street crossings when connecting to your bus. Now you are going to see a slightly different version of the MBTA. b. Lacks any sort of standards in stations, vehicles, or much of anything else. Consequently, unlike a roundup for, say, WMATA in Washington, D.C. (which has a handful of station types and more-or-less the same trains throughout), we'll have a lot of variations along the way. But at least it's simpler than the old token/quarters-only Green Line fares before 2006... progress! Also, have you read our guide to getting started on transit with your stroller or non-strollered toddler? Kids ride the T for Free! Kids 11 and under are free with an adult (maximum 2 kids per adult). Pay Attention to Close Stops! Because the system is not fully accessible and because dragging a toddler onto and off of various vehicles might be less fun than walking outside (at least on a nice day), it's time to take a look at a good Boston map with the MBTA routes on it. Especially downtown, lots of stops are closer together than you may think if you haven't really walked around much. The canonical example here is Aquarium is a short walk from all the other lines without having to transfer to the Blue line. - Most stations in the MBTA are accessible now (check the MBTA map for the latest), which is really quite impressive (even if it took a few lawsuits to get there). Keep your eyes peeled as you head toward the station because elevators may be at the same entrance as the stairs (Porter), or just a few feet away (Copley), or somewhere else entirely (South Station). In other cases, elevators may be inside the fare gates (Charles/MGH). - In recent years, more elevators have been added to secondary entrances (Harvard, Porter) and to make transfers more direct (Park Street). - Every station has at least one "Reduced Fare" gate that's extra wide for wheelchairs and strollers. It's also good for kids walking through while holding your hand. - Each two-car Green Line train is usually made up of one "high floor" car and one "low floor" car. * If you have a stroller, you should aim for the low-floor car to avoid having to lug it up the steps. Head to the middle doors and there is a large open wheelchair bay right by each set of doors. This is the place to camp out. * With a mobile kid, take your pick of cars and seats though you may prefer the high-floor Green Line car as it has pairs of forward/rearward facing seats rather than sideways seats. This way you can worry less about interactions with others on the train (i.e. opportunities for your kid to kick people). 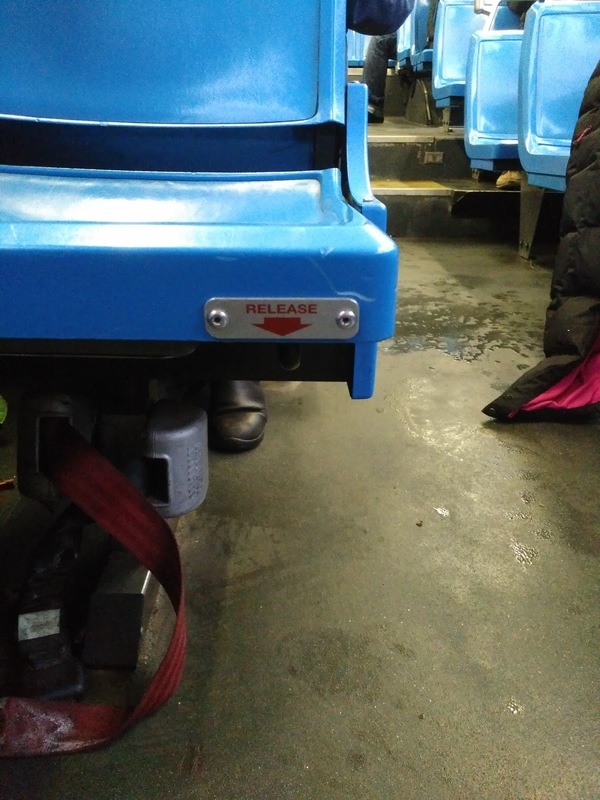 - On the Red/Blue/Orange lines there are not any obvious places for a stroller but you can either try at the front/back of the car (where there may be seats missing to accommodate a wheelchair) or the area at the doors is usually workable. Just be aware of which set of doors will open at each stop so you can be sure to get out of the way. - Silver Line buses are all "low floor" so enter at any door. Check out the bus discussion below on flipping up seats. - Final note of interest: we've used station staircases and escalators as places to learn to go up/down lots of stairs and to learn escalator safety (and also about removing escalator grease from kids... fun times). That said, while we're willing to go down Harvard's many stairs during peak times, we still use the elevator at Park Street given the large hurrying crowds arriving from all directions simultaneously. This is similar to the situation above, but the need to pay up front creates a few wrinkles. To recap, each two-car train is usually made up of one "high floor" car and one "low floor" car. If you have a stroller, you should aim for the low-floor car to avoid having to lug it up the steps. The front of the train is NOT low, so you'll have to reach up to the farebox to tap your CharlieCard. The driver will generally open the back two doors for you (if they're not open already) and you can walk back on the train and enter one of those doors just a (usually) short step up (sorry outer bit of the B and C-lines). There is a large open wheelchair bay right by each set of doors. This is the place to camp out. With a mobile kid, take your pick of cars and board normally though you may prefer the high-floor car as it has pairs of forward/rearward facing seats rather than sideways seats so you can worry less about interactions with others on the train. If you're with an unrestrained or carrier-contained kid, you don't really need any special information, though I will note that sitting in the seats on the steps or further back improves the ability of the child to see out the window so we aim for those. All buses are technically accessible though there are still a few "high floor" buses still rumbling around the fleet. They're being phased out as of early 2016, but I imagine you'll see them for a while. If you come across a high floor bus, board it the same way you would the Green Line at the surface - i.e. pay up front and then board with the stroller in the back door (and lug it up the stairs, sorry). The area of flip-up seats is directly across from the doors (generally 2 sets of 3 seats that flip up). On a low-floor bus, you can board normally through the front. On most types of buses, the entire set of front seats folds up. With a small enough stroller, you should only need to flip up one of the four potential sets of seats. Note: There are a few variants of buses out there that have slightly different configurations including a brand new set of buses that basically just has a spot to park a stroller specifically. In any case, there are two ways to flip up the seat. On some buses, there will be a ring underneath the seat. Pull the ring toward you and then pull the seat up (see picture to the left for how to find the ring). To lower the seat back to its original position once you're about to get off the bus (polite but not necessary), pull the ring up and push the seat down. On other buses, there is a lever behind the seat (sometimes left, sometimes right, but the back of a bus seat is probably not the grossest thing you've touched today anyway). Push the lever to the wall and pull the seat up. To lower, there is a knob on the bottom front of the seat, pull out and push the seat down. Any readers have tips for the Commuter Rail? We haven't tried it with the kiddos. Any readers have tips for the Ferries? We've not tried it with the kiddos either. For the most part, you'll just do the reverse of what you did to enter the vehicle and station. The Green Line technically does not allow rear door exiting during the off-peak, so if the driver does not see you waiting to exit, a shout of "REAR DOOR" is usually sufficient to get them to open it. Hey, it's Boston, you made it this far in the article before someone had to shout at someone else. So yeah, that was a lot, but you can do it! Other Bostonians, what did we miss? What did we screw up? Let us know in the comments below. Are you interested in helping to develop a guide for your city? Even if you know only a part of the system, drop us a line. We will help you put something together and build out a great resource. Email us: transitinfo at acrossb dot com.